I have been driving a project which most of the components are run on Azure as PaaS and others as IaaS. 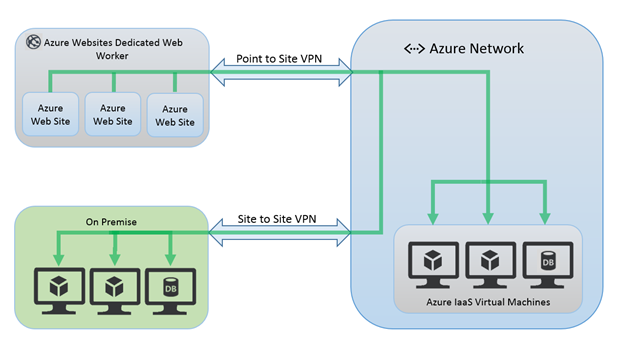 Due to a service dependency, we built a point to site vpn to connect our Apps to our Azure VNet, and a site to site vpn to connect our VM‘s to to our on-premise. So our Apps are able to communicate to our on-premise through the tunnels. Lastly, we defined a custom DNS server ip address which points to one of our dns servers that run on our on-premise. The custom dns setting inherits the VM’s inside the VNet. But not for the App.